Almost a year on from the EU referendum in the UK, it is still unclear what will happen to the rights of the estimated 3.2 million Europeans living in the UK and the 1.2 million Britons living elsewhere in Europe. In her letter triggering Article 50 TEU on 29 March, Theresa May put the interests of citizens as the first priority in the negotiations and called for an early agreement about their rights. Citizens’ rights were also the first priority in the European Council guidelines for Brexit negotiations on 29 April, as well as in the European Parliament’s red lines on Brexit negotiations. However, none of the parties has yet elaborated what this will mean or how it will be done in practice. This event is organised by ECAS, in collaboration with the EU Rights Clinic, New Europeans and European Disability Forum in the project Brexit Takeaways, funded by the Joseph Rowntree Charitable Trust (JRCT). 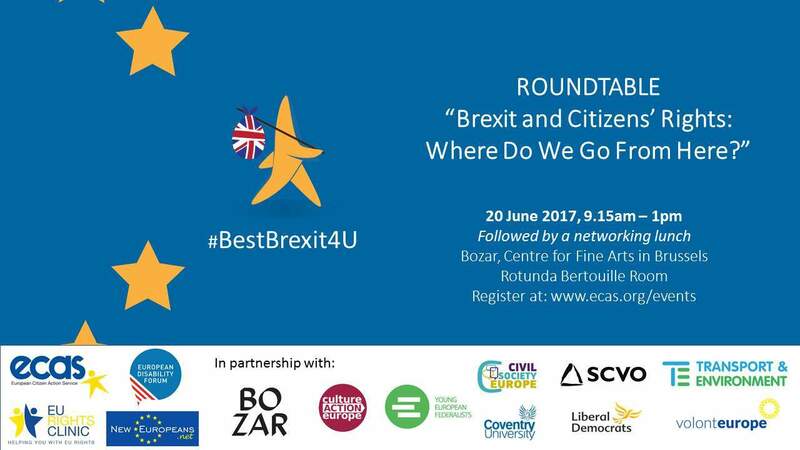 This event is also supported by BOZAR – Centre for Fine Arts Brussels and other civil society organisations, including: Culture Action Europe, JEF-Europe, Civil Society Europe (CSE), Volunteering Matters, Transport and Environment, the Brussels and Europe Liberal Democrats, the Scottish Council for Voluntary Organisations (SCVO) and the Coventry University in the UK.